At some point last year, I decided to try my hand at making homemade butter. Now, for most people, butter is something you buy, not make, particularly once your summer camp days are behind you. But we got hooked on some fabulous artisanal butters when we lived in New York, and it was a bit surprising when we moved here that, with all of the wonderful local foods produced here in Rhode Island, there was no Rhody butter to be had. So I took matters into my own hands. I played with different methods and had varying results, then this Atlantic piece changed everything. 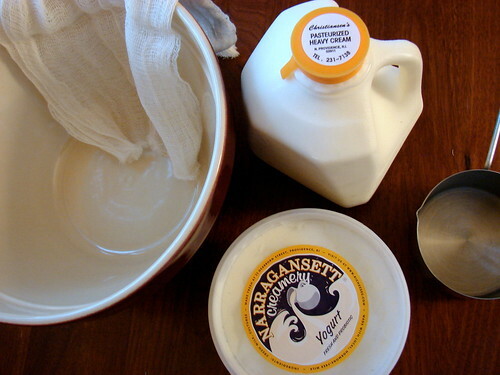 I’d culture the cream I was using, from Christiansen’s Dairy in North Providence, with some tangy Narragansett Creamery yogurt, and instead of using our stand mixer, I’d try the food processor. It couldn’t be easier, and the result was just what I was looking for – butter with a rich flavor and a bit of tang that came together in a matter of minutes. The recipe below makes a double batch, which is the amount I made in advance of our 100 Mile Thanksgiving feast. You may want to halve the recipe to start, as butter this fresh shouldn’t linger in the fridge. Combine the cream and yogurt in a large, non-reactive bowl. Cover the bowl with cheesecloth, and set it in a cool, dark place for 24 to 36 hours. 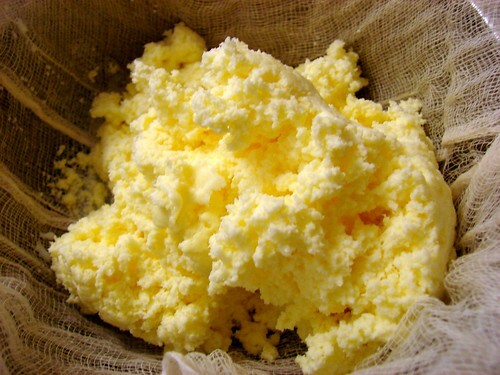 Churn in a food processor until the buttermilk separates from the butter curds. Pour into a cheesecloth-lined strainer set over a bowl, fold the cheesecloth over the butter, and gently weight down with a plate. Set the bowl back in the fridge until very cold, about an hour. Remove and press any remaining buttermilk from the butter. Store the buttermilk in a clean glass jar. If you’re salting the butter, place it on a clean sheet of parchment or waxed paper, sprinkle the salt on top and gently knead it in. Press the butter into a disc or roll, then wrap tightly and refrigerate for up to a week. The butter can also be frozen. I usually use the mixer. What’s the advantage of the food processor over ye olde Kitchene Aide? I am wondering (hoping) that the processor cuts down on the splish splash if buttermilk shooting out of the churning bowl? Yes, it’s a bit less splashy, and in my experience, it goes *a lot* faster. When I was using Big Red it seemed like it took an eternity for the curds to form! love your photos so much. it’s nice to see people still make butter like this. butter is still made at home in my grandmother’s home in Lahore. she is no longer with us, but my aunts, her daughter in laws, have carried on the tradition. Thank you, Shayma! To you as well! Thanks! Will have to give the Cuisinart a shot at it. 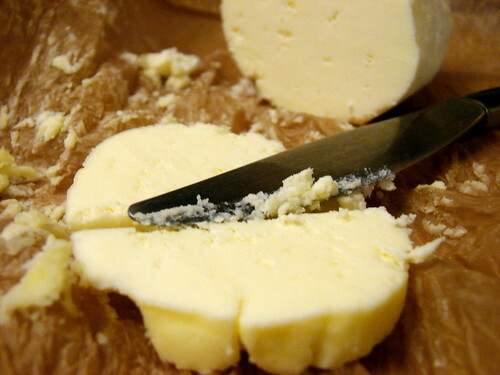 I took a dairy class at Sur La Table recently where we learned to make homemade butter. We only used buttermilk — put it in the food processor for about 10 minutes, then spread it out on a platter and knead the remaining whey out. Sprinkle a minimal amount of salt over it and squeeze out remaining whey in cheese cloth. Shape and wrap in parchment or wax paper to store. The butter will last about 3 months in the freezer. You’ve just given me the perfect homemade stocking-stuffer for my mom!!! Seriously, thank you 100 times. As long as my tiny food processor can take it, I’m in. Do you think that Ronnybrook milk is a good place to start? Do you have any favorite NY-area dairy suppliers to recommend? Jacki – Huh, that’s a fun twist – I’ll have to try it! Love the energy on this site , great food , nice layout , look forward to new ideas. Thank you for posting this. It’s perfect timing, as baking season is approaching. As always, your photos are beautiful and totally inspirational. I haven’t yet used the food pro; I use the stand mixer starting with the balloon whisk, then switching to the paddle when it starts to come together. I’ve had good results. Thanks for this–I have tried butter myself but had no luck. I think my recipe was for uncultured butter (i.e. seriously overbeat the whipped cream until it starts to separate); my suspicion was that I had used ultrapasteurized cream. For your version, do you know if ultrapasteurized can be used? Thanks – I’ve bought heavy cream several times with the intention of making butter but always use it for something else. Must try soon. Like buttah!! I’m looking forward to trying this recipe and method, and maybe some flavored butters! Thanks for this! I made butter a few weeks ago and wasn’t all that impressed – I didn’t think it was as good as the fresh Ronnybrook cream I had started with. But if it had been cultured and salted… Hmmm. I’ll give it another go. Just out of curiosity–which were the butters you liked when you lived in NY? Bless you, oh angel of butterness. Sara – I’m not sure but you can certainly try it. Let me know how it works if you do! Curry – it’s super easy – do try it! Dale – Oh, yes. I love softening some and adding herbs or blue cheese to top a steak. Cara – Ronnybrook makes a good butter. We loved the Evans Farmhouse Creamery butter. And I don’t know if it was a one-off thing, but we got some great butter once made by Consider Bardwell. well, this isn’t nearly as talented as what you’re doing, but i have started to flavor (storebought) butter to go with what i’m serving. so recently i made chili which i was serving with shredded cheese, sour cream and chives, and i served some fresh-baked bread with a butter mix i made that had chives and kosher salt in it. it was tasty!